How Much Does It Cost to Declaw a Cat? Although there's some variation depending on your kitty's unique situation, the average cost to declaw a cat is between about $100 to $500. Information regarding hidden costs or common complications can help pet owners find a tighter ballpark figure. The cumulative cost of having a cat declawed depends on many factors. To receive a more reliable estimate, you will need to speak directly with your veterinarian. Most often, your can will need a preliminary examination to determine his needs. Procedural costs can vary greatly between animal hospitals and clinics. These variations are often due to the prestige and experience of the doctor and your feline's medical history. How Much Do Ragdoll Cats Cost? How Much Does it Cost to Neuter a Dog? 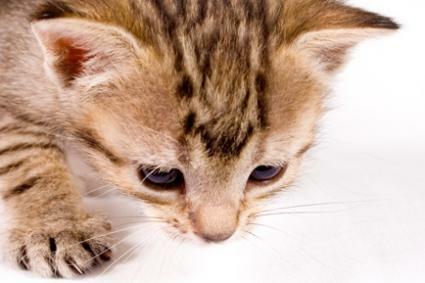 Prior to having your cat declawed, most vets will want to examine a cat to get a picture of the animal's overall health, and to determine which procedure will be used to remove the nails. The cost of the exam is typically whatever your vet charges for an office visit. Again, costs are extremely varied. For example, the VCA Arden Veterinary Hospital in Glendale, CA charges about $60 for an examination fee prior to declawing. A short trip across Glendale will land you at the Parkview Pet Clinic which only charges around $50. Neither initial office fee includes the cost of blood work, which is approximately $50. Such tests are highly recommended prior to surgery to uncover whether your cat has any conditions that may affect its recovery. There is more than one way to declaw a cat, so the cost will initially depend on the procedure you and your veterinarian choose. Be aware that declawing is usually only performed on the front paws. Onychectomy - Priced at about $100-$250. This is the most common method vets use. It requires the vet to surgically remove the entire first toe joint that contains the nail bed using a guillotine-style nail trimmer. This form of amputation is the quickest way to complete the procedure and lowers a cat's risk of spending prolonged time under anesthesia. Disarticulation - The price of this procedure is also approximately $100-$250. The procedure is performed similarly to an onychectomy; however, a scalpel is used to sever the bone. This method takes longer, so the risks of anesthesia are greater. Laser surgery - Priced between $250 and $400. This is the most expensive method of declawing a cat; however, it's believed to be less painful in the long run. The risk of post surgical bleeding is also significantly less. However, it is extremely important that the vet performing the laser procedure be very experienced using the equipment because it's possible to burn the tissue during the process. The longer the procedure, the more anesthetic is needed to keep your cat completely unconscious. Your cat's weight also plays a role in determining the amount of anesthetic used. Since vets prefer to declaw kittens at the age of four months, the amount needed is kept to a minimum. However, most vets will declaw cats up to the age of five, so the amount of anesthetic required and the charge to provide it, can vary quite a bit. Most reputable animal hospitals will include the cost of anesthesia within their overall charge. However, this can often elevate the cost of a flat fee to a hefty amount, so be sure to ask about it during your cat's initial consultation. Some vets prefer to perform the surgery early in the morning and keep the animal in recovery at the clinic until late afternoon. In other cases, it may be necessary to keep the cat at the clinic overnight. Overnight charges add to the entire cost of the procedure. In fact, the length of time your cat remains within the clinic will be one of the most significant aspects of the procedural cost. How long does your cat have to stay? That depends on the procedure used because certain procedures are more thorough, thus requiring extended monitoring and care. Note that whether or not your animal has been spayed or neutered can also affect its length of hospitalization. Any surgical procedure carries a risk of infection. Vets routinely administer an antibiotic injection after surgery to stave off the possibility of infection. In some cases, oral antibiotics are prescribed, either to ensure against a future infection or to treat one that develops after the patient returns home. The cost of the medication depends on the antibiotic used. Declawing includes a painful recovery period for your cat, and many pets require pain medication to help them through the process. Pain management may be delivered orally, intravenously at the clinic, or in the form of a medicated patch. The cost of any of these methods varies widely according to the type of medication used, and how long your pet requires it. Many clinics will include the cost of such medications within a flat procedural fee. For clinics who do not include medications under an umbrella fee, costs will be determined by your cat's needs. What procedural method will be used? What contraindications and complications can and often arise as a result of this method? What additional costs may be incurred as a result of the aforementioned complications? Don't be afraid to comparison shop for clinics, although it's unlikely you'll be able to sit down with several veterinarians without incurring multiple exam/consultation fees. Equipping yourself with a fundamental knowledge of just what affects major price differences can help you discern whether or not some costs are justified or simply arbitrary. However, where any type of surgical procedure is concerned, the efficiency, competence, and success record of the medical team should always take priority over the cost.